The Epcot Coral Reef Restaurant is a very unique place to dine in Walt Disney World. Located in the The Seas with Nemo and Friends Pavilion in Epcot the Coral Reef Restaurant is certainly a room with a view. The Epcot Coral Reef Restaurant has a wall of 8 feet high windows which look onto the huge salt water aquarium. 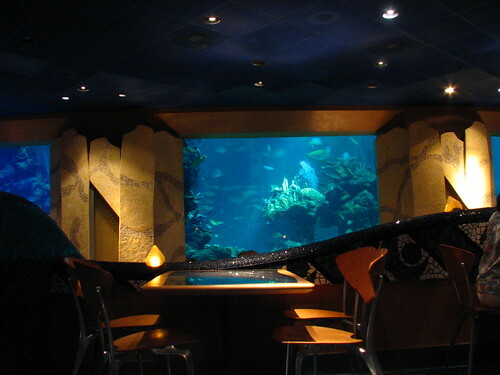 Diners can view not only 85 species of tropical fish but also the divers who often swim pass the windows. Somehow the humans are often more interesting than the fish! Coral Reef is one of the most expensive of the Disney Epcot restaurants. However, it still only uses one Dining Credit if you are on the Disney Dining Plan. This means it is a great value if you are using the Disney Dining Plan. 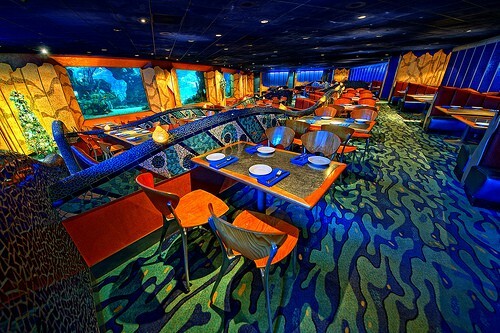 Where are the best tables in Disney’s Coral Reef? Whilst it is tempting to think that a table right by the aquarium is the best place to be, it is also good to be one table away. The tables in the restaurant are ‘banked’ so that all the diners get a pretty good view. Tables in the middle of the room are not the best. Always ask if you can be seated next to the aquarium. If there is an extra short waiting time we suggest that you tough it out and wait for the best seats in the house. A really nice feature is that if you get a seat by the aquarium you will be given a “cheat sheet” which identifies the fish in the tank This is a great way to keep young children entertained. The adults find it pretty cool as well. If you get the chance to dine at the Epcot Coral Reef Restaurant you really should. The setting and the food make it one of the best places to dine in Epcot and it is one of our favorites in Disney World. Epcot Coral Reef Restaurant offers both lunch and dinner. The main theme of course is seafood but there are plenty of other choices on the menu. The dinner menu is the same, and the prices are also the same as lunch. The usual soft beverages, coffee and tea are available as well as a cocktail, beer and wine menu. A favorite cocktail is The Abyss which is Skyy Vodka, Bacardi Superior Rum, Blue Caracas and Pineapple Juice. The wine menu is not particularly extensive but it contains one wine that I would be very interested to try. Lasseter Family Winery St. Emilion Blend, Alexander Valley at $16 a glass and $69 a bottle. Think you may recognize the name? This is from the winery owned by the family of Pixar’s John Lasseter. There is a separate kids menu at Coral Reef. For $8.99 kids aged between 3 and 9 get a choice of one appetizer, one entree and a dessert, with a choice of milk, bottled water or apple juice. The Coral Reef restaurant dress code is very relaxed. Pretty much anything that you would comfortably wear to Epcot theme park will be acceptable within the Coral Reef dress code. It is one of the nicer Epcot restaurants. However, if you come here wearing Mickey Ears you are going to feel more at home than if you wear a tie! Is a visit to Epcot’s Coral Reef Restaurant worth it? We think that if you are lucky enough to be able to get reservations here you should take the opportunity. Service is not necessarily the best of the Disney restaurants as often the wait staff seem to be responsible for rather too many diners. However the food is very good and the ambiance is unique. What do you think of Epcot Coral Reef restaurant?